On January 25, 2017 in Astana city in Nazarbayev University. In each oblast center a special fire inception and the Relay stage will take place. On January 26 – Petropavlovsk, Kokshetau, Kostanai, Pavlodar, Karaganda and Ust-Kamenogorsk. On January 27 – Uralsk, Aktobe, Atyrau, Aktau. On January 28 – Kyzylorda, Taraz, Shymkent, Taldykorgan. On January 29 – fire inception will take place in Al-Farabi Kazakhstan State University in Almaty city. 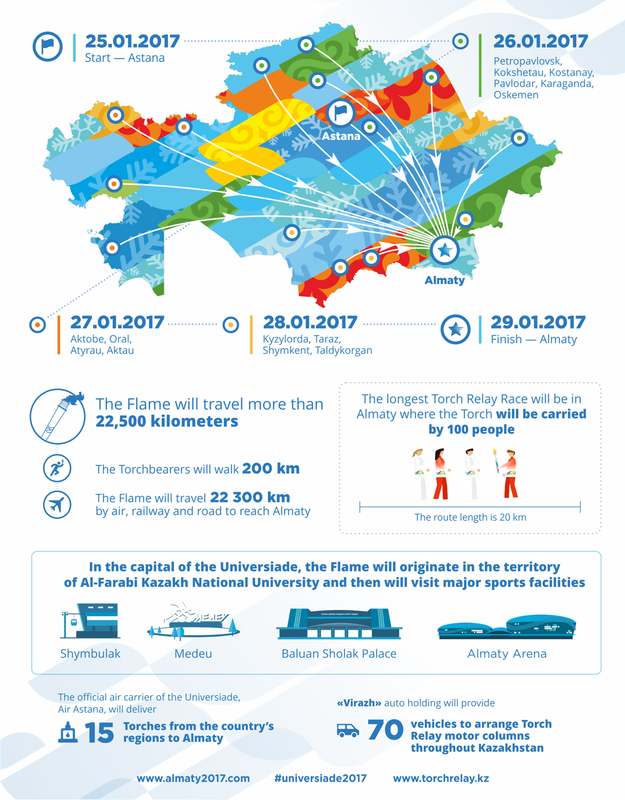 Final the Universiade Fire inception will take place on the Opening Ceremony on January 29, 2017 in Almaty city. The Relay of the 28th World Winter of Almaty of 2017 is a unique concept having no parallel in the history of the Olympic Movement. The basis of the Universiade Fire will be 16 fires, which will incept in various parts of Kazakhstan. 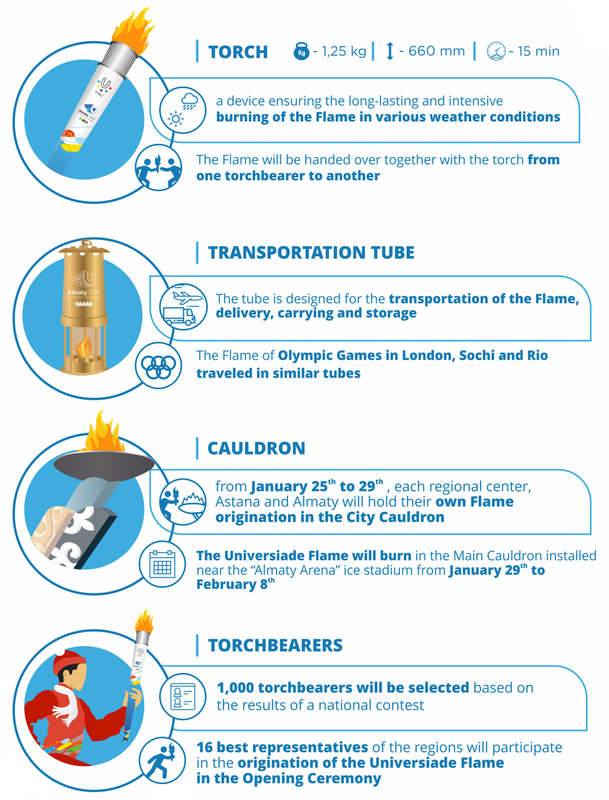 The Fire Relay will become one of the brightest events of the Universiade. The Relay will extend the project scale from one city to the whole country. The fire will be in 16 cities of Kazakhstan and bridge more than 200 kilometers by land and 2,300 km by air. A solemn ceremony of the Fire lighting will take place on January 25 in Astana city, in Nazarbayev University – a national brand of a higher education of the Republic of Kazakhstan. On January 26, 27 and 28 own Fire will be incepted in each region. 14 areas will carry out the Relay stage which will take place on streets of the regional center. On January 29 the best students of regions will deliver Fire to Almaty. In the opening day of Games in Al-Farabi KazSU the final Almaty stage of Relay starts. The project will be finished in the new ice arena Almaty Arena at a culmination point of the opening ceremony of Games. 16 representatives of regions will unite 16 Fires in the main cauldron of the Universiade, symbolizing unity of the Kazakhstan students. 1,000 torchbearers aged from 17 up to 28 years old will participate in the project. Also torchbearers will include eminent persons of sport, culture, science, representatives of FISU. In each city torchbearers, passing each other a torch each 200 meters, will run on the central streets, covering sights and large educational institutions of regions. Fire will be carried by the students successful in sport, science, culture. Selection of torchbearers started on September 1. The first torchbearer, considering sporting achievements at the Olympic Games in Rio-2016, was the Almaty swimmer Dmitry Balandin. Results of a competition in selection of torchbearers will be published on December 16. In each region the route covers sights, educational centers and sporting venues of the regional center. Under the Torch Relay route development factors of safety of torchbearers and audience, and also a possibility to use of alternative directions of movement were considered: pedestrian zones river embankments, etc. to minimize motor traffic restrictions. In each regional center and the city of Astana the route will constitute 12 kilometers. In Almaty – 20 km. Thus, each torchbearer should cover a distance of 200 meters. 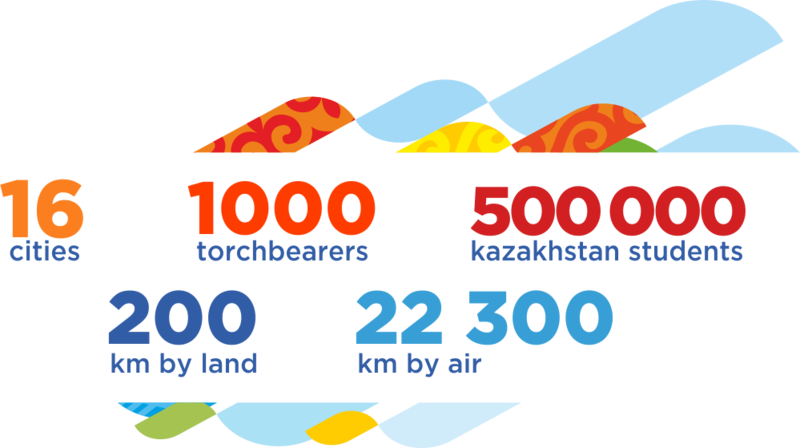 In the country scales the Relay route includes air flights from regional centers to the city of Almaty. The Fire will be delivered to the capital of the Student’s Games onboard passenger planes of Air Astana company – an official carrier of Universiade-2017.